Sterling Luxury Group offers a 1-Day Luxury Brand Sales Training Workshop that teaches you the techniques needed to work with today’s sophisticated consumer and guide them to finalize a purchase. We teach salespeople how to exceed expectations and appeal to the emotions and inner desires of the most discerning customer. Sterling Luxury Group’s step-by-step approach to Luxury Brand Sales Training covers every moment from before a customer is ever greeted through how to capitalize on your customer relationship long after they have left the store. Through a combination of demonstration, interactive role-play sessions, and hands-on training, the workshop will teach sales consultants the essentials of brand and image building by exploring customer relationship development and how to deliver the luxury brand experience. Project the appropriate image with confidence and poise. Conduct yourself using proper etiquette and formalities. Establish intimate customer relationships that convert into sales. Identify your customer’s individual needs and wants. Exceed client expectations and provide superior product knowledge. Effectively communicate your luxury brand’s story and identity. Present and sell luxury brands as a lifestyle – not just products. Understand the psychology of customers and techniques for closing the sale. Nurture and build your customer relationships. Thoughtful service and a sense of caring and quality are vital when connecting with your customers. 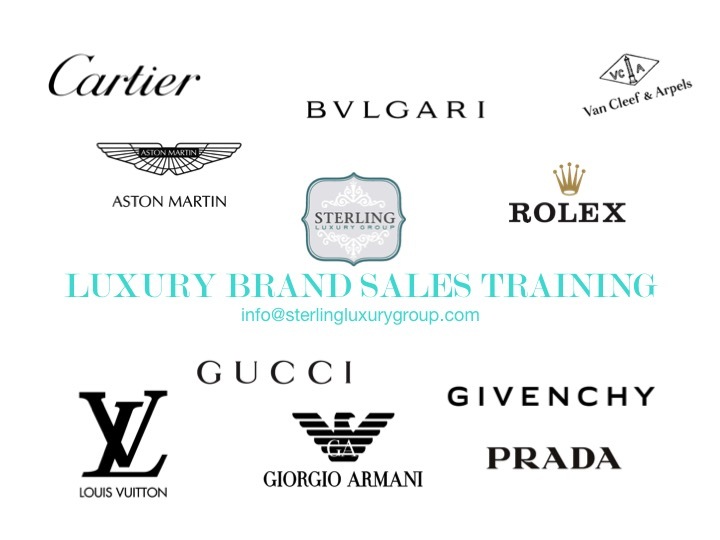 Sterling Luxury Group’s 1-Day Luxury Brand Sales Training Workshop will give your sales consultants a competitive advantage in a world where luxury is constantly being redefined. Once you have decided to enlist your sales associates our program, please contact our team to review your corporate culture and goals so that we can create a customized program that inspires your staff and captures the passion for your brand so that you can maximize your sales as well as your corporate image. Contact us today to receive further news about our future training programs.